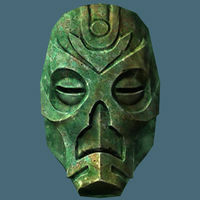 Siege on the Dragon Cult: Enter the ruins of Forelhost and defeat Rahgot to recover his mask for Captain Valmir. Placing Rahgot on its pedestal at Bromjunaar Sanctuary will remove any bonuses it gained from tempering. The editor ID for the mask is "ArmorDragonPriestMaskOrichalumHelmet" instead of "Orichalcum". All dragon priest masks are considered to be circlets in terms of equipment slots, meaning they can be worn simultaneously with some bugged items, as detailed under circlets. This page was last modified on 29 November 2018, at 16:31.